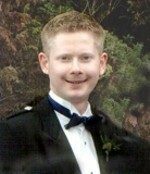 Scott Gordon made an initial impact on the Scottish Music Scene, when, aged 14, he won the "Scottish Junior Accordion Championship" in 1991. Drums were Scott's first love, and he was already playing professionally at 11 years old! He moved to play Keyboards, then Accordion; and it's on this instrument that he has gained tremendous respect and success. In 1994 he won "The All Scotland Senior Accordion Championship", quickly followed by the "Champion of Champions" title at Oban.Scott's great versatility has led already to many broadcasts and recording sessions. Featured on Accordion, Drums or Keyboards, he has played with many top Scottish Dance & Ceilidh Bands. Recently his own "SCOTT GORDON CEILIDH BAND" won premier titles at both Perth & Musselburgh. Record producer and musician Derek Hamilton recently described Scott as "One of the future giants of the Scottish Dance Music Scene". 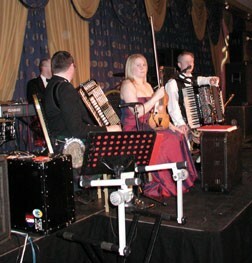 The son of popular Scottish entertainers, Joe Gordon & Sally Logan, Scott is now married to top Fiddler Susan Mackintosh, and they often play as a duo, with Scott on Piano. Their home is in Westhill, near Aberdeen. Scott can be heard on many CDs with other Scottish Bands, and his own first CD,SCOTT GORDON, "MELODY and RHYTHM" is available from record shops, or from this website. The Amhearst Twostep. (9) Reels .Jean's Reel, The Moving Cloud. (10) Continental Waltz, Zingarella. (11) Jig, Schottische & Reel The Blackthorn Stick, The Laird O' Drumblair, The Auld Fiddler (12) 6/8 Pipe MarchesThe Bonawe Highlanders, Angus MacKinnon. (13) Tribute to Jimmy Shand Memories of Willie Snaith of Hexham. (14) Tribute to Iain MacPhail Miss Kay Rose, Miss C.M Barbour, Iain MacPhail's Compliments to Gordon Jamieson, Miss Suzanne Barbour. Sound Clips. Click on Title below.